Josh Eichorn: Filled with vanilla puddin’ power! A funeral service is held for Rapture after her recent murder at the hands of Solar Man. The ceremony is attended by her former teammates in Freak Force and a few other people. Dragon is having a tough time dealing with the death, mostly as he had already mourned for her many years ago in his original reality. 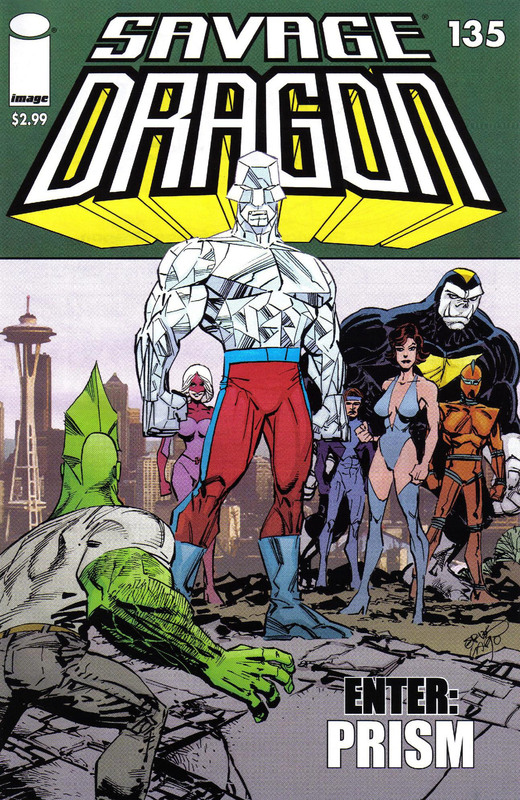 The fact that Solar Man killed Rapture and nothing is being done about him is the thing that upsets Dragon the most. The funeral is interrupted by a number of reporters who accuse Dragon of the following; he helped Mister Glum take over the world after failing to steal the election with Ronald Winston Urass, perpetrated a hoax involving Universo to repair his reputation, knew that Rapture was a killer before he fathered her child, worked with CyberFace to conquer the world and is now hiding him, and finally, that he is obsolete now that Solar Man has returned. Dragon is annoyed by the treatment he has been receiving and admits to making a few mistakes over the years but denies that he ever did anything inherently evil like the reporters are claiming. His rant is broadcasted with Sam Haze’s replacement stepping up the campaign against him. Solar Man is mentioned as nearly completing the restoration of the planet of Glum’s reign. He continues to eliminate criminal super-freaks, killing the siblings Goofus and Gallant. After taking a flight over to Seattle, Dragon is taken to meet wealthy businessman Ben Palmer who had arranged for his transport there. Ben has not been listening to the media’s treatment of Dragon and knows him to still be a hero. He would like Dragon’s assistance in ridding the city of the Power Broker who fled there during Glum’s reign. Dragon talks about how he had found all kinds of research in Gertie Funt’s apartment regarding attaining super-powers and the Power Broker was one such possibility. Ben’s girlfriend and secretary Karen Griffith learns of Dragon’s presence and is not happy as she believes him to be a menace. Meanwhile in Dimension-X, Mister Glum laments having to retreat back to his home world after having to flee Earth when he was removed from power by Dragon. He vows to Angel Dragon that he will have his revenge upon Dragon even if it is the last thing he does. Elsewhere in this realm, Malcolm Dragon fends off more monsters and hopes that they can find a way back to Earth soon. Back on Earth, Fire Lord blasts his way out of the wreckage caused by Red Giant crushing his allies with part of a building. He hopes to uncover some of his allies so that they can have their revenge upon the heroes that had defeated them. She-Dragon is fitted with her classic costume again by Art “The Tailor” Rosenbaum before catching a taxi. A disturbance is seen up ahead where a group of super-freaks are attacking a young woman and she heads off to intervene. A group of Vicious Circle thugs are confronted by Mako who ends up attacking his colleagues over their inaction against Solar Man. He strongly believes that the villains should unite into one huge force and then confront the murderous superhero. The fear coming from the Vicious Circle sickens Mako and he accuses them of being cowards who will all die unless they overcome their fear. A retired business executive named Ben Palmer awakens in his Orlando, Florida home alongside his girlfriend Karen Griffith. They get themselves ready before heading to the beach for the day where the wealthy-former diamond magnate is questioned about his frequent disappearances. Before an answer can be offered up by Ben, a humanoid monster arises from the depths. The Amphibi-Man has been sent as the herald of his people that are anarchists, hoping to bring down all forms of government. 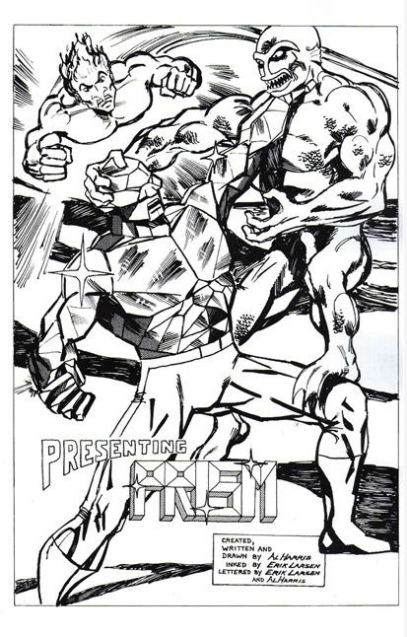 He begins a rampage but Ben surprises his girlfriend as he rises up to stop this fiend, transforming before her eyes into the superhero known as Prism. A fight soon breaks out which results in the murderous villain being forced to retreat. In the aftermath of this conflict, Karen demands an explanation and hears how Ben Palmer had travelled to Pretoria in South Africa on a business trip. He was personally inspecting a diamond mine when a cave-in left him the only survivor of his party. As he explored the caverns, he discovered a statue of a man that was made completely out of diamond. A mysterious voice beckoned Ben to touch the statue which left his mind imprisoned within it, leaving his own body to serve as the new home to N’taka. This powerful sorcerer accidentally trapped his own mind in the statue centuries ago and had remained within ever since. He departed to find freedom but realised that the cave-in was too large an obstacle to overcome alone. N’taka merged his body with that of the statue but this meant that Ben Palmer was now fully in control of both forms, leaving his own mind submerged, threatening to one day return. Prism was now born and he returned to the United States to form the Centurions with other fellow superheroes. Now, the hero takes Karen home to fully accept the status of her boyfriend. A distress call is made from the military to request help in fending off a villain that is attacking Cape Canaveral. A former astronaut named Edward Porter felt betrayed when his solar vessel malfunctioned and transformed into an ethereal superhuman renamed Solar Flare. He has come for revenge but Prism arrives in time to prevent too much destruction. Solar Flare’s natural gaseous state allows him to avoid harm at the hands of his foe but Prism comes up with a plan. He instead uses his laser vision to detonate an explosion within one of the nearby shuttles and the resulting blast scatters the very atoms of the villain. Karen Griffith had witnessed this fight but she is abducted into an aircraft.